Although there are lots of ideas these days about how to improve U.S. public schools—a number of which are under renewed scrutiny—Jason Kamras thinks he’s got a simple solution. It’s a radical idea he shares with Warren Buffet and Michelle Rhee, among others: Do away with school choice. No private schools, no homeschooling. He admits the idea isn’t realistic, but he believes it’s an important thought-experiment nonetheless. 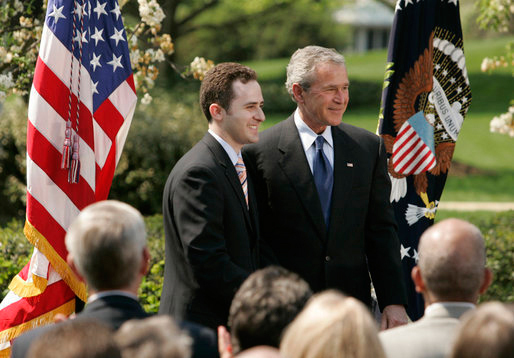 Kamras—who taught middle school through Teach For America between earning his bachelor’s degree, from Princeton University, and a master’s in education from Harvard—was named 2005 National Teacher of the Year by President George W. Bush in a White House ceremony. After a decade in the classroom, Kamras left to work under Michelle Rhee in the central office of the District of Columbia Public Schools (DCPS). In his current role as “chief of human capital,” he leads DCPS’ efforts to have highly effective teachers and leaders in every school building. Under Rhee’s leadership, DCPS implemented a new teacher contract that permitted merit pay and reduced the roles played by teacher tenure and seniority. DCPS also linked student achievement to teacher evaluation through its IMPACT rating system. Last month, I met Kamras in his office to talk about DCPS and human capital. Q: Is there anything you wish you knew before you started your office job? A: I think the reason we were able to think differently and creatively was because we hadn’t done this before and we didn’t know what the guardrails were—what you were supposed to do or not supposed to do. We did what we honestly thought was right for the school system and for our students. That naiveté, I think, worked to our advantage. The DCPS evaluation system introduced in 2009, IMPACT, looked at 4,000 teachers in 123 schools. Based on student achievement, what do the data tell you about assessing teacher performance? If a teacher is not effective according to IMPACT, what happens? I think an exciting extension of the work we’ve started is a deeper focus on [staff] retention. We’ve poured a ton of money into that already through IMPACTplus, our performance-based compensation system. But money isn’t everything, which is why we’re developing lots of other non-monetary approaches to keeping our best people. For example, we’re about to launch a new career ladder for teachers. It’s designed to give our high-performers all sorts of leadership opportunities without pulling them out of the classroom. It will also expose our best educators to the important national education policy discussions that happen in our backyard here in Washington, D.C.
Another strategic area that we’re exploring is how to extend the reach of our best people. We’re looking at everything from paying great teachers more to take on a few extra students to leveraging technology so that our best AP calculus teachers can impact not just 30 students in one classroom, but 500 students across the city. The key question here is: how do we double, triple or even quadruple the impact of our best teachers? How does professional development for teachers fit into your plans? We have targeted most of our professional development this year on the key literacy skills needed for success with the Common Core State Standards. And this focus is not just for English teachers; we’re training teachers across all content areas to incorporate literacy instruction into their lessons. Given the digital world so many kids live in, how do you see education and technology fitting into public education? I think there’s tremendous possibility in technology to help us do our work more effectively, and to accelerate the pace of learning for our students. At the very least, we need to begin experimenting. For example, I’ve been in so many foreign language classes where I scratch my head and wonder: “If we just gave everybody Rosetta Stone and an iPad, would students be better off?” I don’t know. But we should find out. I’m certainly not interested in removing teachers from the equation. That doesn’t make any sense. But there may be some things that technology can do better and more efficiently than we can. For example, the fact that it’s  and teachers still grade multiple-choice tests by hand is ridiculous. That’s an extraordinarily inefficient use of a teacher’s time and energy. My hope is that technology can free teachers to do what only they can do: develop relationships; motivate and inspire; push students to think in complex and nuanced ways; and orchestrate all aspects of a classroom experience. Having said all that, I’m also suspicious of folks who view technology as the next silver bullet in education. It’s not. And we have lots of examples of failure when it comes to technology in education. Thirty years ago, the push was to get computers in every classroom. Now you’ve got millions of computers in classrooms across America, but are they being used to their potential? Often not. Fifteen years ago, the push was for interactive white boards. In some classrooms, they’re having a dramatic effect on instruction. But in many others, they’re collecting dust with permanent ink on them. The bottom line: technology is only a tool. We need great teachers and great principals to make the best use of that tool. How does DCPS use technology in teacher development? We’re piloting a number of different things to see what actually makes a difference for students. One platform that I’m really excited about is called LearnZillion. It provides short “chalkboard” clips from rock-star teachers on a whole host of literacy and math standards. It also includes a “director’s cut,” through which viewers can hear voiceovers from the teachers themselves, explaining why they approached the lesson in the way they did. My hunch is that this might be more impactful and cost-effective than doubling the number of instructional coaches we have. As I noted before, we’ve invested nearly $15 million in our coaches. Next year we’re hoping to experiment with some innovations, including “real-time” coaching. This involves a teacher wearing an ear-piece (like a news anchor), which allows an expert educator in the back of the room to give in-the-moment guidance without disrupting the lesson. And what’s happening on the administrative side? We’re revising the principal evaluation system and giving it the same level of rigor that we gave to IMPACT for teachers. On top of that, we’re pouring more effort into principal recruitment and professional development. And we’re having some exciting conversations with a university in the area to develop a leadership program to help some of our rising stars accelerate their growth. Would these people earn an MBA? That’s something we’re talking about. Specifically, what are you doing to encourage and develop school leaders? We just enacted a new, much more competitive compensation system that is based on performance. We’re about to do the same for our assistant principals. We’re also thinking a lot about leadership development. In fact, we’re building our own leadership pipeline program, through which we’ll groom our best teachers, coaches and [assistant principals] to become outstanding principals. Not only is this a great way to develop school leaders, but it’s also a great way to retain staff. We’re also planning to invest in our central office human capital work. This always winds up getting cut in tight budget times, but we’ve made a commitment to fund this next year. The idea is to rethink the central office human capital continuum just as we’ve done for teachers and principals. In short, we need to reinvent recruitment, selection, evaluation, development, compensation and retention for the folks who work in this building. We’ve realized that to sustain our reform effort, we need to pay attention to the folks here, too. Advice for teachers on how to be effective when it comes to classroom management? 1. Be absolutely clear with students about what your expectations are. 2. Be absolutely clear about what the consequences are, both positive and negative, for choosing to follow or not follow those expectations. 3. Be extraordinarily consistent in following through on those consequences. 4. The best management system is a really just a great lesson. 5. Most importantly, no system or set of rules is going to do everything for you. At the end of the day, you need to develop real and meaningful relationships with your students. Spend the time to get to know them; learn who they are; and be humble with them. I am biased but I don’t think there’s any more important work in America. Education is the gateway to freedom and liberty in this country. If you’re passionate about helping our nation reach its greatest aspirations, then become an educator! What are your thoughts about young people involved in education advocacy—for example, Students for Education Reform—even though they may not have worked in a classroom? Not everyone is made to be a teacher. But that doesn’t mean you can’t make an important contribution in the world of education. At the same time, I encourage young people who are interested in education policy to consider teaching first. The experience is invaluable. It gives you humility, along with respect for how challenging it is to move the needle on the achievement gap. To whom can parents turn if they think their child’s needs aren’t being met? They should first talk to their children’s teachers. But if they’re not getting satisfactory answers, they should go to the principal, to the superintendent, even to their elected officials. Parents have enormous power to force change in public schools. And you don’t need a Ph.D. to know if your child’s teacher is good or not – just spend 30 minutes in your child’s classroom. I once heard you describe the radical idea of doing away with school choice. It made me feel really uncomfortable. 1. If you live in D.C. and you have children, you have to send your kids to school in D.C. You can’t move. 2. You have to send your children to a public school—no privates, no homeschooling. 3. Your children will be randomly assigned to a D.C. public school. If these changes were put into place, how fast would it take to turn things around? Five minutes? Ten? I’m not suggesting this is realistic, or that it’s the right way to approach the problem. It’s just a provocative thought-experiment, designed to demonstrate that until every family sees the fate of our public schools as their own problem, we may suffer a lack of urgency and prioritization when it comes to education reform.